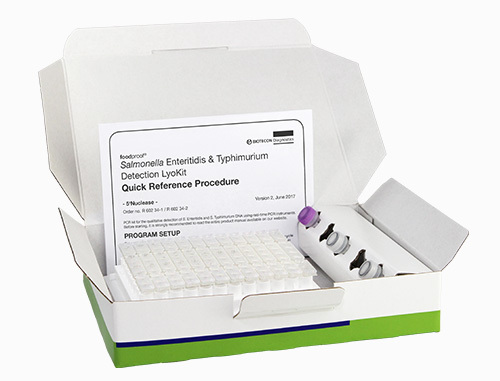 The foodproof Salmonella Enteritidis and Typhimurium Detection Kit detects and differentiates S. Enteritidis and S. Typhimurium in one test. These two serovars are responsible for about 80% of all foodborne Salmonella infections. Most commonly salmonellosis is associated with the consumption of poultry and egg products. According to Regulation (EU) No 1086/2011, all fresh poultry must be examined for S. Enteritidis and S. Typhimurium contamination. In the United States, the Food and Drug Administration (FDA) has published the Final Rule “Prevention of Salmonella Enteritidis in Shell Eggs During Production, Storage, and Transportation” (74 FR 33030), which will introduce methods requiring egg producers to test for S. Enteritidis.